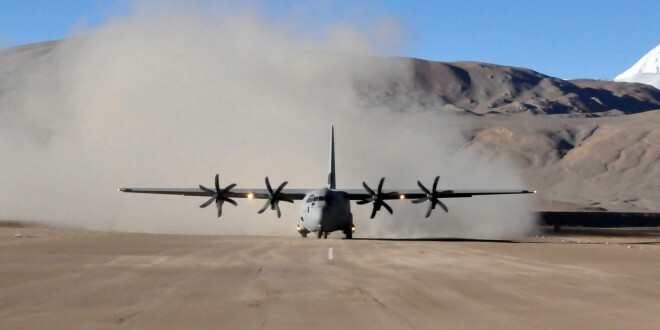 Yesterday, we wrote about the world record breaking effort of the Indian Air Force landing one of its C-130J Super Hercules strategic air transporters at the world’s highest airfield at Daulat Beg Oldi (DBO). Read the story here. With a hat-tip to Shiv Aroor, we present some high resolution pictures of the ‘Herc’ at DBO. The aircraft was on the ground for 30 minutes and kept its engines on the entire time it was on the ground. The C-130J is part of the six aircraft that India ordered from the U.S. Government, and is based at Hindon near the capital New Delhi, with the newly raised 77 Squadron IAF named ‘Veiled Vipers’, and is used by the special forces, including the famous NSG Black Cats. 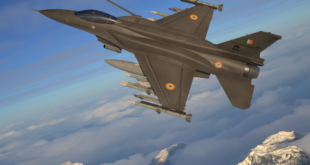 The squadron’s motto “Kill with Stealth”, signifies the all-weather, stealthy ‘black-ops’ mission capabilities in deploying the special forces to deal with many varieties of threats. 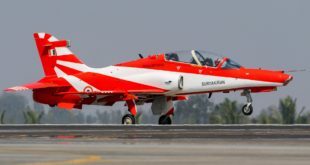 India has realised the capabilities of this great aircraft and is ordering another six. The Aksai Chin region of Ladakh is hotly contested by both India and China. India and China fought a border war in 1962 and in 1993 accepted the Line of Actual Control (LAC) as the de-facto international border. Daulat Beg Oldi is located just 4.5 kms away from the Karakoram pass and supports Indian troops on the Siachen glacier, which a major thorn in China’s strategic interests in the region. This map shows a clearer picture. While the Chinese side of Aksai Chin is easily approachable from the east, for India, it is extremely difficult, and involves traversing the highest motor-able road in the world, the Khardung La pass. This paper in PDF format from the Institute for Defence Studies and Analysis gives significant insight on why this high altitude desert called DBO is so important. Chinese troops have been repeatedly violating agreements with India, and have crossed the LAC (Line of Actual Control) more than 150 times this year alone. 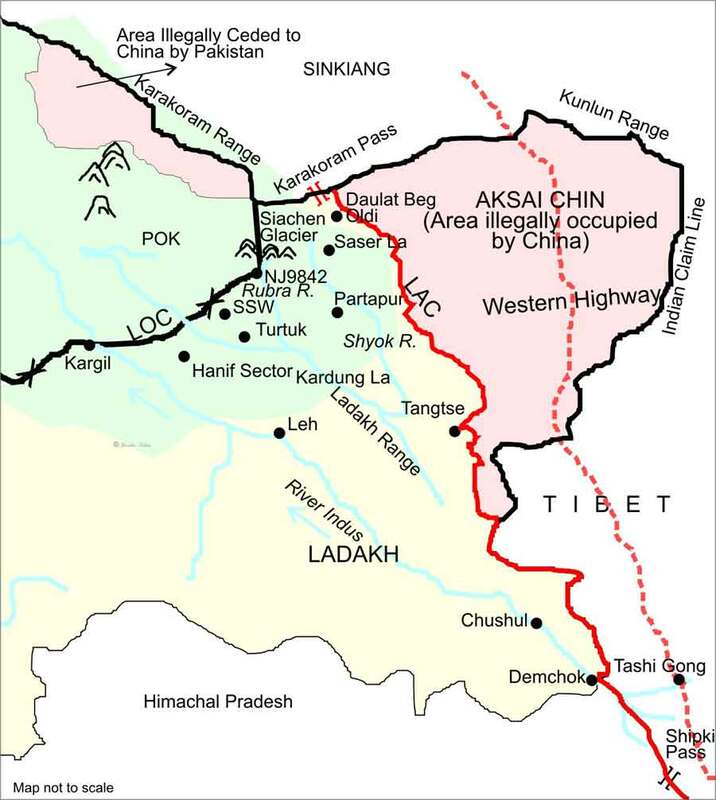 On April 15th, Chinese troops blatantly crossed the border near DBO and pitched tents right in the face of the Indian army. This infographic shows what happened. 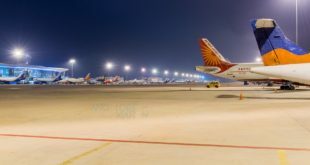 Instead of fighting back the aggression, the UPA2 government took no action, and even sent its foreign minister Salman Khurshid to Beijing, pretending nothing had happened. At that time, Parliament had to be adjourned when the government was cornered by the opposition for its spineless tactics. The landing of the Hercules today with its ability to carry in 20 tons, is a definite signal to the Chinese of the unmuzzling of the Indian armed forces and their ability to respond. In the longer term, expect India to upgrade the landing strip to accommodate the big daddy, the Boeing C-17 Globemaster III heavy airlifter.